Recipe Source: The recipes provided for the challenge came from or were inspired by recipes found through a variety of online sources (including, but not limited to allrecipes.com). Also invaluable was the book “A Taste of Challah,” by Tamar Ansh. 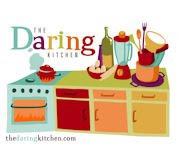 Blog-checking lines: May’s Daring Bakers’ Challenge was pretty twisted – Ruth from The Crafts of Mommyhood challenged us to make challah! Using recipes from all over, and tips from “A Taste of Challah,” by Tamar Ansh, she encouraged us to bake beautifully braided breads. 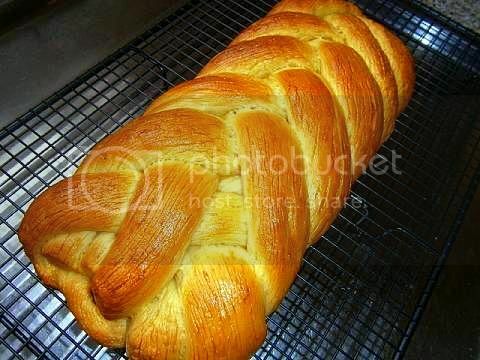 I have never made braided bread before so I was thrilled when I saw the challenge was Challah. In Finland we have a sweet bread called pulla that is braided (three strands) I saw my mum make it many times when I was a child and always wanted to make some. The final bread is very similar in taste to pulla I was very pleased about that. I decided to do a six strand braid. I was extra careful about making sure that the braids were all the same (size, shape and weight) and that I did a double coating of egg wash. I made a jury-rigged dough proofing cabinet the bread raised in only 45 minutes the final raising took about 20 minutes. The process of making the bread was very straight forward, it was the braiding that was a little challenging for me, I practised the braiding using strands of playdough (dough made with salt and coloured dye) after a dozen attempts I had the technique down pat, looking at the final result I thought I had done a reasonable job on it for a first attempt. 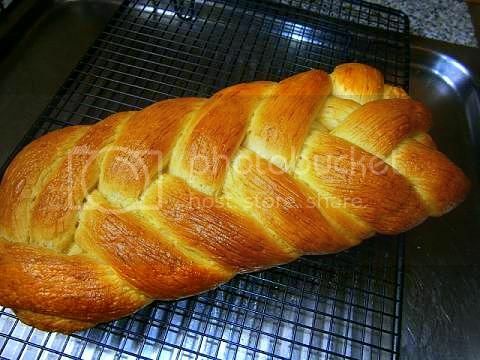 I was fairly pleased with the final outcome, it was only after I had looked at it I realised that I should of made the ropes of dough tapered I had made them absolutely straight and even the entire length of the strand hence the reason why the final challah loaf looks so flatt but I didn't mind that at all. Overall a reasonable job I thought. The jury-rigged proofing cabinet – fill the sink 5 cm (2 inches) with hot water from the tap. Place a metal pan on the bottom place the bowl with the dough on the pan making sure the bowl doesn't touch the hot water. 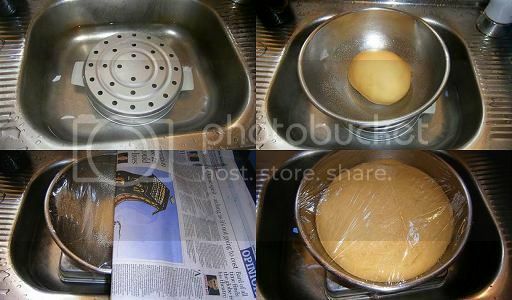 Cover the bowl with plastic wrap and then cover the sink with newspaper (this traps the warmth and steam) then prove the bread. I liked doing this so much I will try some other shapes again soon. As always - great job! And you've attempted a 6 braid one :) KUDOS! I'm following you now, from Portugal! 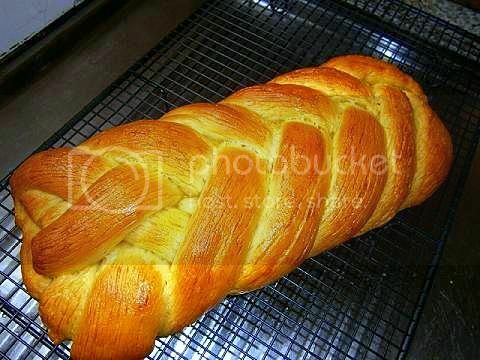 Wonderful challah! Yes, I thought it tasted like pulla, too. Especially the cinnamon swirl one I made! Beautiful job! Your challah turned out awesome! Your loaf came out beautifully - and very clever proofing dome! 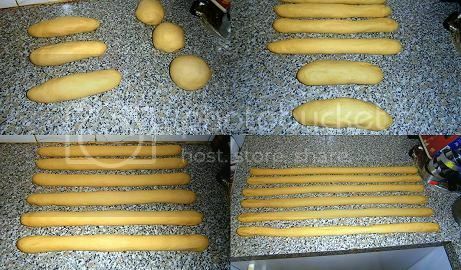 Great idea to practice with playdough - it made for a beautiful finished loaf! Great work. Beautiful six strand. MIne was four and didn't look this perfect. Awesome job on one succesfully completed challenge! I tried your proofing cabinet idea a few weeks ago and officially declare your a GENIUS. I used brown paper bags rather than newspaper and covered them with sack towels. Even with cold, rainy weather, my dough rose in half the time. GENIUS! Audax, Your challah looks perfect. Very creative proofing box! 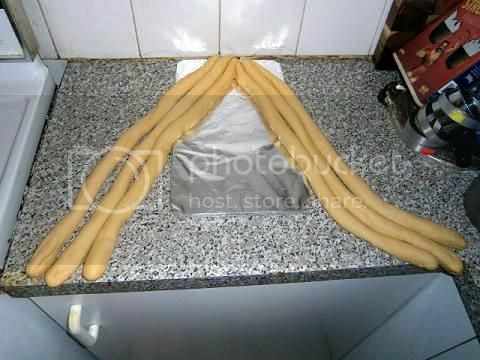 it's always hard to wait for bread to be ready so it is great to be able to help it along especially in cooler weather. He Audax, thanks for your welcome to my first challenge, I'm so happy to be a member :). 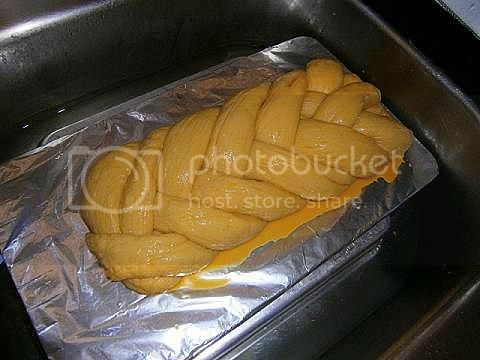 Your challah i perfect for me, you're great. Great job with the braiding. I am glad that the challenge brough back happy childhood memories, and that you enjoyed the process! Thank you for baking with me this month! I can't believe this is your first time with braided bread. Bravo! Looks great and I love you made a proofing box. Very cool!!! Everything you do always looks so professional!! So pretty, Audax! I only did three braids, but you've inspired me to go back and try again. You can always be counted on to be the very best DB out there.